The Postfix Mail Transfer Agent (MTA) is a high performance open source e-mail server system. This guide will help you get Postfix running on your Debian 6 (Squeeze) Linode, using Dovecot for IMAP/POP3 service and MySQL to store information on virtual domains and users. This guide is largely based on Christoph Haas’s great ISP-style Email Server with Debian-Lenny and Postfix 2.5 guide and HowtoForge Groupware Server With Group-Office, Postfix, Dovecot And SpamAssassin On Debian Lenny (5.0), with some packages omitted. NOTE: Please read all of the information presented in this guide carefully. There are many files and commands that will need to be edited as part of the setup process: please do not simply copy and paste the example blocks. This will install the Postfix mail server, the MySQL database server, the Dovecot IMAP and POP daemons, and several supporting packages that provide services related to authentication. You will be prompted to choose a root password for MySQL; make sure you select a strong password comprised of letters, numbers, and non-alphanumeric characters. Write this password down and keep it in a safe place for later reference. Next, you’ll be prompted to select the type of mail server configuration you want for your VPS. Select “Internet Site” and continue. Now you’ll need to set the system mail name. This should be a fully qualified domain name (FQDN) that points to your Linode’s IP address. This example uses an example organization’s domain. You should set the reverse DNS for your Linode’s IP address to the fully qualified domain name you assign as the system mail name, while other domains you wish to host email for will be handled later through virtual domain setup steps. This completes the initial package configuration steps. Next, you’ll set up a MySQL database to handle virtual domains and users. Start the MySQL shell by issuing the following command. 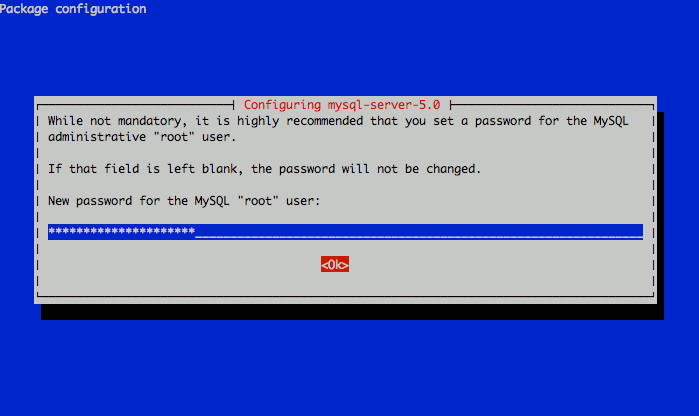 You’ll be prompted to enter the root password for MySQL that you assigned during the initial setup. You’ll be presented with an interface similar to the following. Create a mail administration user called mail_admin and grant it permissions on the mail database with the following commands. Please be sure to replace “mail_admin_password” with a password you select for this user. This is required for Postfix to be able to communicate with the database server. If you have MySQL set up to run on another IP address (such as an internal IP), you will need to substitute this IP address in place of 127.0.0.1 during the Postfix configuration steps. Please note that it is not advisable to run MySQL on a publicly-accessible IP address. Next, you’ll perform additional Postfix configuration to set up communication with the database. 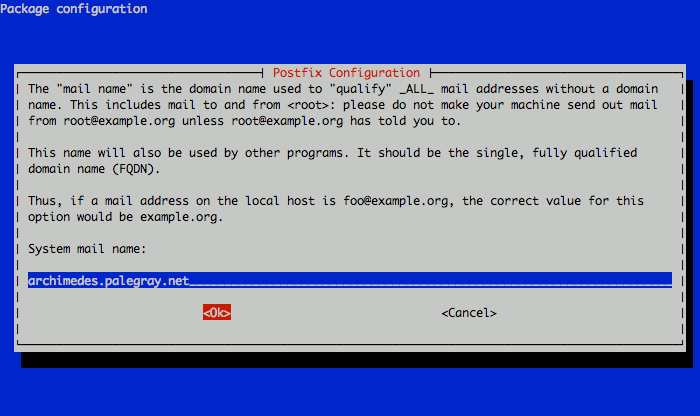 Create a virtual domain configuration file for Postfix called /etc/postfix/mysql-virtual_domains.cf with the following contents. Be sure to replace “mail_admin_password” with the password you chose earlier for the MySQL mail administrator user. Create a virtual forwarding file for Postfix called /etc/postfix/mysql-virtual_forwardings.cf with the following contents. Be sure to replace “mail_admin_password” with the password you chose earlier for the MySQL mail administrator user. 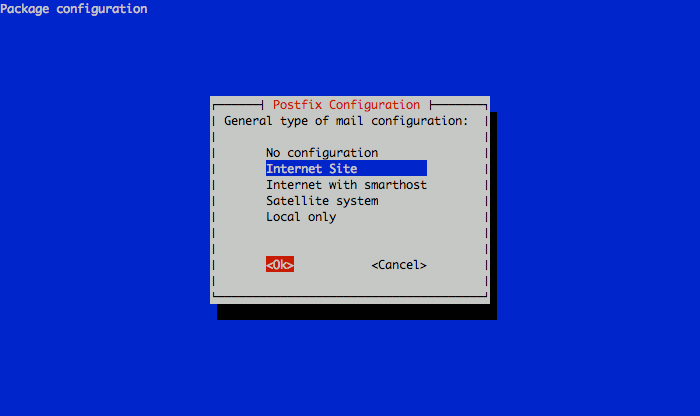 Create a virtual mailbox configuration file for Postfix called /etc/postfix/mysql-virtual_mailboxes.cf with the following contents. Be sure to replace “mail_admin_password” with the password you chose earlier for the MySQL mail administrator user. Create a virtual email mapping file for Postfix called /etc/postfix/mysql-virtual_email2email.cf with the following contents. Be sure to replace “mail_admin_password” with the password you chose earlier for the MySQL mail administrator user. Next, create a user and group for mail handling. All virtual mailboxes will be stored under this user’s home directory. Issue the following commands to complete the remaining steps required for Postfix configuration. Please be sure to replace “server.example.com” with the fully qualified domain name you used for your system mail name. This completes the configuration for Postfix. Next, you’ll make an SSL certificate for the Postfix server that contains values appropriate for your organization. You will be asked to enter several values similar to the output shown below. Be sure to enter the fully qualified domain name you used for the system mailname in place of “server.example.com”. This completes SSL certificate creation for Postfix. Next, you’ll configure saslauthd to use MySQL for user authentication. Make a backup copy of the /etc/default/saslauthd file by issuing the following command. Next, create the file /etc/pam.d/smtp and copy in the following two lines. Be sure to change “mail_admin_password” to the password you chose for your mail administration MySQL user earlier. Create a file named /etc/postfix/sasl/smtpd.conf with the following contents. Be sure to change “mail_admin_password” to the password you chose for your mail administration MySQL user earlier. This completes configuration for saslauthd. Next, you’ll configure Dovecot to use MySQL for IMAP/POP3 user authentication. Edit the file /etc/postfix/master.cf and add the dovecot service to the bottom of the file. Issue the following command to make a backup copy of your /etc/dovecot/dovecot.conf file. Replace the contents of the file with the following example, substituting your system’s domain name for example.com. MySQL will be used to store password information, so /etc/dovecot/dovecot-sql.conf must be edited. Issue the following command to make a backup copy of the existing file. Replace the contents of the file with the following example, making sure to replace “main_admin_password” with your mail password. You can test your POP3 server to make sure it’s running properly by issuing the following command. Enter the command “quit” to return to your shell. This completes the Dovecot configuration. Next, you’ll make sure aliases are configured properly. Edit the file /etc/aliases, making sure the “postmaster” and “root” directives are set properly for your organization. This completes alias configuration. Next, you’ll test Postfix to make sure it’s operating properly. Issue the command quit to terminate the Postfix connection. Next, you’ll populate the MySQL database with domains and email users. Please note that you’ll need to modify the DNS records for any domains that you wish to handle email by adding an MX record that points to your mail server’s fully qualified domain name. If MX records already exist for a domain you would like to handle the email for, you’ll need to either delete them or set them to a larger priority number than your mail server. Smaller priority numbers indicate higher priority for mail delivery, with “0” being the highest priority. We’ll use the MySQL shell to add support for the domain “example.com”, which will have an email account called “sales”. You should substitute one of your domains for “example.com” in these statements, along with a strong password for the “password” entry in the second SQL statement. You’ll need to send a welcome message to new email accounts before they can be accessed via IMAP or POP3. This is because the mailboxes for new users won’t be created until an email is received for them. To send a welcome message from the command line, you may use the mailx utility. Issue the following command to send the message. Press Ctrl+D to complete the message. You can safely leave the field for “CC:” blank. This completes the configuration for a new domain and email user. Given the possibility for virtual hosting a large number of virtual domains on a single mail system, the username portion of an email address (i.e. before the @ sign) is not sufficient to authenticate to the mail server. When email users authenticate to the server, they must supply their email clients with the entire email address created above as their username. Now you can test to see what the users of your email server would see with their email clients. You may be prompted to create the root mailbox. This is not required. If you see an e-mail in the inbox, you’ve successfully configured Postfix, Dovecot, and MySQL to provide email services for virtual domains and users on your Linode. Please consult the “More Information” section for additional resources that may prove useful in the administration of your new email server.